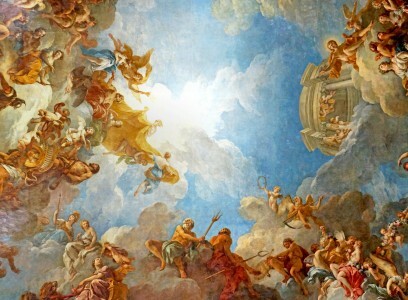 The Apotheosis of Hercules is a large painting on the ceiling of the Hercules Room in the Palace of Versailles in France. It was painted in 1736 by François Lemoyne at the direction of King Louis XIV. The painting depicts Hercules arriving at Mount Olympus in a chariot (left side).